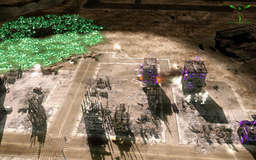 C&C3: The Forgotten is a modification for Command & Conquer 3: Tiberium Wars which tells the story of a neglected faction of humans featured in Tiberian Sun, but were marked by their absence from C&C3. They are 'The Forgotten'; a race of mutated humans afflicted by the Tiberium infestation. CD : Lets start with a brief introduction; who is Blbpaws and what is your role within C&C3: The Forgotten? Blbpaws : I'm the Mod Manager at C&C Labs, which is a site that is dedicated to pushing the envelope of C&C creativity. The Forgotten is one of our two in-house projects currently under devleopment, and I lead it. I'm the lead designer for gameplay, campaign, and fiction, and I coordinate the various team members' work to make sure everything gets done in a (hopefully) effective way. CD : Please describe C&C3: The Forgotten, what are the main goals of the mod? Blbpaws : We want to tell a story--a C&C story, to be exact. As longtime fans, we recognize that the core essence of C&C isn't in the whizbang Hollywood effects or the movie star cameos, but in the gameplay and in the deep fiction. We thought, as creative fans, that we wanted to try our hand at crafting both. The result is a mod that brings several new innovative gameplay features to the table, has a full campaign, and has a complex fiction told with High Definition Full Motion Videos, as well as a series of supplementary pieces. CD : Can we expect to see new sides/structures/units? Blbpaws : Yes, absolutely. The Forgotten are a faction entirely new to C&C 3, though they have long played a pivotal role in the C&C fiction. For those who don't know, they are the individuals suffering from Tiberium illnesses living in war-ravaged areas of the planet. The new units and structures reflect this, with older technology, creative dual-use equipment, and innovative techniques. One of the neat things is that in the campaign you'll start out with very few units, and gain new ones through your own actions in most cases. For example, before you can get access to Nod's old Tick Tanks, you'll need to find and capture an old Nod base; before you can use aircraft or missile technology, you'll need to infiltrate a GDI air and missile base. In other cases, their units are drawn from their role in past C&Cs, such as the war Camper, a combat vehicle similar to the one they employed in C&C Tiberian Sun. CD : Who's working on C&C3: The Forgotten, anyone we might recognise from previous projects? Blbpaws : The team is very experienced, and nearly everyone has done serious modding before. Most of them, including our Head Artist Tsumetai, our Head Coder CommieDog, our Senior Advisor Mike Thomas, and our Producer Nick Allain worked on C&C All Stars, the last C&C Labs project. Others, such as our singleplayer mission scripters and mapmakers Drummin and Predatore, oversee or contribute to the map section on C&C Labs. Still others, such as the artist Kane Nash, are working with us for the first time but are notable names within the broader C&C community. We've also drawn some folks either already in the industry or aspiring to futures in that world, such as our talented 3D artist Nielsen. I have no idea how I ended up working with such talented people, but I'm incredibly grateful for this team. CD : The single player campaign is obviously a key part of C&C3: The Forgotten, can you give us a hint as to what is to come? Blbpaws : Sure. This is something I'm personally proudest of, and one of the things that I spend the most time on. As I said, our goal is to create a complex fiction (see more here) that fits the broader C&C story. Someone well-versed in the C&C world will appreciate the depth of our tale and how it interweaves with the canon, yet someone who hasn't played any previous games will hopefully also find the plight of The Forgotten compelling and interesting. The story is told through a series of missions, each quite long, difficult, and complex--they are closer to the Tiberian Sun or Firestorm missions than the C&C 3 ones. These are supplemented by a series of HD Full Motion Videos, written by myself and produced by Broken Wall Films, that will give you more of the Mutant backstory and explain the context for each mission. These films tie into the C&C 3 story as well, which runs concurrently with ours. In addition, we're starting to work on a series of story "artifacts," short little documents from our world that lend further insight into the characters and context. The first one was revealed here and the second I'll reveal right now. It's a journal entry from the former intelligence partner of our main character and you can read it right here. Blbpaws : I'm really very happy with it. There were times when I worried--you could say part of my job is constantly worrying--but I think we've overcome the technical bumps and we have a talented team that is motivated and dedicated to making a great mod. We just moved into the beta stage and have added about 20 testers, and they've been very positive in their comments. They've tracked down a few bugs that we've squashed. Things are looking up, and the goal is to get the full release done by this summer. CD : Describe a typical day in the life of your development team? Blbpaws : It's very compartmentalized, mostly because everyone has their role and works on what they want to work on. I handle the stuff that's directly in my purview, such as the gameplay balance, campaign design, or creative writing. The rest of my time is spent working with other staff members making sure everything is going well, or recruiting more staff (here's a plug in that regard: we're looking for a 2D artist; if you're interested email me at ). With so many people on board, that can take time, and things have only gotten more exciting with the arrival of the testers. There's no doubt that we have a lot of balls up in the air, but that's the only way to get a project of this magnitude done. Blbpaws : Yes. There were certainly times that I thought we wouldn't finish. Most mod teams don't, and just because we managed to have incredible success with C&C All Stars--more than 70,000 downloads--didn't mean our next project was going to do well. As far as technical difficulties, we certainly had them, but the Mod SDK wizards known as CommieDog and Tsumetai overcame them. Coordinating the writing, casting, shooting, and editing of the Full Motion Videos was another Herculean task--now I understand why people get paid to do this--but a ton of fun. In large part, we have managed to overcome the difficulties because we are having fun and because we all follow the old adage that those who say something can't be done shouldn't get in the way of those who are doing it. We all have busy lives off the internet, but we enjoy working with each other. If no one downloads this mod, I'd still have had fun making it, but knowing people will be enjoying it makes it just that much cooler. Blbpaws : In terms of modding its probably Zero Hour, because it offered a nice combination of flexibility and accessibility. C&C 3's engine is more powerful, and I'm lucky to work with great people who can put the new tools to their full potential, but I think it's too inaccessible for most people. As for playing, I've played and love them all. The Red Alert 2 gameplay did an excellent job mixing air, land, and sea units in a balanced way, but the Tiberian storyline has always been most compelling to me (and yes, I hated the C&C 4 ending). How's that for a broad answer? Blbpaws : Yes. With C&C 4 a flop, as many of us predicted, it is easy to say C&C is dead. It may soon be. But there remain those who love a good story, a good game, and a good mission. If you are one of those people, we think we have a mod for you. Consider following us at http://theforgotten.cnclabs.com or http://www.moddb.com/mods/cc-3-the-forgotten. I consider myself truly honored to be able to do this as a hobby, and I have no idea what I did to deserve it. Working with such incredible people, some of whom I've worked with for 7 years and some who just joined our private beta test last month, is deeply rewarding and a lot of fun. If C&C is dead, I'll leave the community with a lot of wonderful memories, valuable experiences, and a deep graditude for such a wild, unexpected ride. CD : And finally, what is your favourite cheese? Blbpaws : Though I'm partial to some authentic smoked mozzerella, high quality cheddar carries the day. Thank you very much to Blbpaws for taking the time to answer my questions and provide such in-depth answers. If there is anyone you'd like to see us interview in the future, or any particular questions you'd like to ask, suggest them at our forums.